Azimut Yachts, a leading brand in luxury yachting, is getting ready to face the recently begun yachting season with an ambitious growth plan that has two main thrusts: enrichment of the range, aimed at responding to the requests of an increasingly demanding clientele, and development of new production sites, needed in order to significantly increase the number of boats built each year. With regard to new products development, alongside the traditional flybridge and "S" lines, which will be enriched with new models to take advantage of all the opportunities on the market, two new lines are set to make their debuts: Leonardo and Magellano, each designed for a very specific type of customer and therefore destined to attract new classes of owners. With its Leonardo line, Azimut Yachts aims to offer its customers custom-tailored boats to enable maximum enjoyment of socializing at sea. They will be boats characterized by roomy interior spaces, extremely pleasurable and luxurious, with special attention to the saloon, conceived as a large loft. Other distinctive aspects will be the large terrace on the sea and the care lavished on the interior design, inspired by the most sophisticated, modern trends. The Magellano line is instead aimed at a more mature customer who may have already had a Fly and wants to strike out on a new adventure, fully living the sailing experience but without forgoing comfort. So Magellano will be focused on those who have an authentic passion for the sea, who like long trips (the Magellano boats have a range of 1,500 nautical miles at a cruising speed of over 20 knots) and aren't afraid of adverse weather conditions but nevertheless want to surround themselves with fine details and luxurious finishings. The design of the Magellano line was entrusted to the noted architect and designer Ken Freivokh, already the author of highly successful yacht designs. The production capacity, concentrated until now in Avigliana, will be more than doubled thanks to the use of new shipyards (in Avigliana, Viareggio and Savona) but especially thanks to the birth of a new production facility at Arbatax, in Sardinia, where the company recently purchased a third of the former Sardinian paper mill (around 100,000 m2) in order to convert it into an important new production center. With these prerequisites Azimut Yachts plans to present nine new models to the market in the next 14 months. The first two, made their Italian debut at the Genoa Boat Show, are the Azimut 82 and the Azimut 70. Italy's Gruppo Baglietto has revealed that Francesco Pisciotta, general manager of Cantieri Navali Baglietto, is to resign from his position on October 31, 2008. The role will be filled by Maurizio Cei, Cantieri Navali Baglietto's CEO. Gruppo Baglietto is proud to announce the imminent opening of a new sales office in London headed by Mark Cavendish. Mark Cavendish, previously Sales and Marketing Director of Benetti shipyards brings to Baglietto over 20 years of experience in the international yachting industry. Gruppo Baglietto London will support the Commercial and marketing department of Gruppo Baglietto, lead by Fabio Ermetto. Bavaria Yachtbau GmbH, one of the largest global sail and motor yacht builders, announced that Andres Cardenas has been appointed chief executive officer, effective immediately. Cardenas replaces Kay Schwabedal who has left the company by mutual agreement. Bavaria Yachtbau expressed its appreciation to Mr. Schwabedal for his contributions over the past year. Mr. Cardenas’s professional career spans more than 17 years with logistics companies in the automobile and boatbuilding industry where he established a strong track record as a chief executive officer and general manager. Most recently, Mr. Cardenas, age 48, led the Rodman Group - Spain’s largest producer of motorboats, effectively repositioning the company’s international business and driving new product development. He previously served as head of Logistica and Akront S.A., and in senior management positions with Opel and BMW, where he successfully implemented a series of initiatives driving the firms’ reorganization, performance and international positioning. Mr Cardenas, a native Spanish, grew up in Germany and lived in Germany for more than 20 years. Andres Cardenas is a technical engineer by training and holds a MBA-PDA degree from IESE in Spain. The Bénéteau Group, the world number one for sailboats and the European leader in the 5 to 15 meters powerboats market, is preparing for its arrival on the yacht market (powerboats over 15 meters). In Italy, which leads the way in luxury yacht design and innovation, the Group has just created Monte Carlo Yachts SPA, the company that will be responsible for developing a new range of Open and Fly-Bridge Yachts. The Group is entrusting the management of this new company to the Italian manager Carla Demaria. Carla Demaria has forged her career within the Italian group Azimut-Benetti, where, for over 20 years, she served on its management committee, and since 2002 as the President and CEO of Atlantis. The experience she has built up and her in-depth knowledge of the market have also seen her being appointed Vice-President of UCINA, the Italian yachting federation. Benetti’s order book is constantly filling up even in this period of a rather unfavorable international economic situation. It seems as if the shipyard in Viareggio has not been affected by the crisis as it is celebrating the nautical season with four new contracts over and above the three with which they inaugurated the 2008-2009 nautical season, being a 60 m, a 45 m, a 30 m and two 85’. There have been many appointments fixed by "hot" clients totaling 850, distributed over 3 nautical shows being 232 at Cannes, 398 at Monaco and 221 at Genoa. The French shows were attended mainly by clients from Eastern Europe, whereas Genoa was attented by Italian, English and French clients. To this must be added the visits to the stand mainly during the Genoa exhibition by student bodies, by students of the Nautical Institute and final year student in naval engineering and trade schools particularly by carpenters that the said group organizes in cooperation with professional institutes to recover short-handed professionalism, which in this case refers to the shipwrights. Building a Bertram Yacht is a pledge of passionate craftsmanship. The production behind these yachts is a beautiful combination between creative engineering, advanced technology, quality construction, fine materials and especially the dedication of those very individuals that manufacture the luxury vessels, some of whom have been building Bertram's since the company’s inception in 1961. To prove Bertram Yachts longstanding commitment to excellence, the leading sport-fish manufacturer is spearheading a new initiative that is sure to give the brand a true competitive advantage. Bertram stands strongly behind its product and is so confident that it is announcing a limited warranty that will now be extended to two years on manufacturer built construction and encompasses five years for the yachts hull and fiberglass structural components. This new two-year warranty period will apply to all 2009 and future Bertram yachts; this is a distinctive offer in the sport-fishing yacht industry. The new warranty program is an all encompassing process that starts with a new tracking program that facilitates faster claim processing. Alpha Data Systems, a boating industry company that focuses on warranty claim systems, has provided a software platform that was altered to fit the unique Bertram parts and claims process. Dealer service organizations are able to submit claims using the on-line platform and are provided with on-line training to support their use of the user-friendly program. The new two year warranty period under the Bertram Limited Warranty will cover repairs or replacements for defects in warrant able items manufactured by Bertram for two years from the date of purchase. Additionally, all of the yachts hull and its fiberglass structural components will be covered for a warranty period of 5 years. In the gala night organized on the 8th October 2008 at Villa Lo Zerbino the nomination for the Boat of the Year, Motor section was won by the new Fiart 4SEVEN Genius. From the renowned Italian builder, the new model represents an example mixing latest new technology with traditional workmanship. In less then 15 meters the new Fiart offers great maneuverability, intelligent use of spaces. Very clever the solutions of the aft bathing platform and the hard top with soft top opening in Kevlar, not adding much weight to the boat. The Fountain Worldwide 1st4boats.com offshore powerboat team, piloted by Craig Wilson and James Sheppard, captured the necessary points for a back-to-back championship title. In very rough seas off the southern coast of Portugal, the Fountain team ran a conservative race focused on keeping their nearest point’s challenger behind them. With a third place finish in race number one of the Portuguese Grand Prix of the Sea, the team ended up on the podium, but more importantly they earned the right to call themselves Powerboat P1 world champions for the second consecutive year. In a series covering 7 countries, and 2 continents, Powerboat P1 is a true international series with teams from all over the world. With the competition model of P1 featuring a horsepower to weight ratio formula, the series provides a level playing field for marine manufacturers to test their products, and demonstrate their capabilities. Boat builders, engine builders and drive train manufacturers compete head-to-head, with representation from both the United States and Europe. For the marine manufacturers, the level playing field offers the opportunity for true ‘race on Sunday, sell on Monday’ promotion. This philosophy is the life blood of Fountain Powerboats, the builder of the repeat championship winning boat. Fountain is based in Washington, NC, and has built a reputation on winning races and taking that winning technology to the consumer. The Fountain Worldwide 1st4boats.com team is powered by Ilmor V-10 engines, the marine version of the engine that powers the awesome Dodge Viper. Paul Ray, President of Ilmor made the trip the Portimão to watch the team, and was thrilled with the outcome. Grand Banks Yachts today launched a new "microsite" – a specialized section of its main corporate web site – designed to offer information, insights and comparisons about the fuel economy of today’s Heritage, Eastbay and Aleutian models. The microsite includes several sections, including an overview of new electronically-controlled diesel engine technologies that enable today’s GB owners to gain fuel efficiency even with bigger, faster engines. The site also compares third-party information about the fuel burn rate of older GBs with smaller engines to today’s GB models, and offers testimonials from owners about the fuel economy they have observed first hand. Other sections provide tips on how owners can help to make their boats more fuel efficient, and provide observations that can help boaters evaluate their options when it comes to matters of speed vs. fuel costs. US boatbuilders Mainship Corporation and Luhrs Corporation will close their St Augustine, Florida plant and relocate their operations to Luhrs Marine Group's existing Millville, New Jersey production facility. The transfer of tooling will commence immediately. Beginning in January 2009, Luhrs and Mainship models will be manufactured concurrently with Silverton and Ovation units. The decision was made by John and Warren Luhrs after an 18-month critical evaluation of the production and cost efficiencies that would be realized by the centralization of the power boat division in Luhrs Marine Group's New Jersey manufacturing facility. Maritimo Offshore, manufacturer of luxury long-range cruisers recently held its biggest ‘Maritimo Muster’ ever with the running of the second annual Queensland Muster. 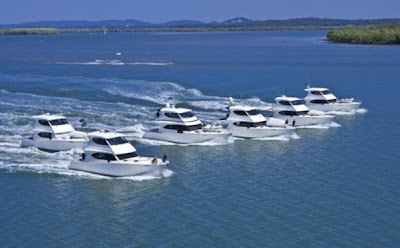 A total of 15 luxury Maritimo vessels took part the Muster which was run from Hope Harbour on the Gold Coast to Port Hinchinbrook in far-north Queensland. The 13-day Muster took in a round of the Australian Offshore Powerboat Championships at Redcliff on its way north. The Maritimo Musters are free to all Maritimo owners and are designed to help owners get the most out of their boats as well as to allow them to socialise with other owners and talk about their boats. Participants can enter and leave the Muster at different ports and there are lay days where activities like golf, sightseeing, shopping or enjoying some of the local restaurants can be enjoyed. This year’s Muster travelled through some of Australia’s most spectacular cruising grounds including the Gold Coast, Sunshine Coast, and the Whitsundays. Long-range luxury cruiser builder Maritimo on Australia's Gold Coast has reported a successful Genoa International Boat Show, which saw the yard sell both its display boats and secure three further orders. The news follows the lay offs which the yard says was a result of the loss of more than AU$20m in international orders, due mostly to the global financial downturn. Maritimo CEO Bill Barry-Cotter says that the current economic climate is 'not all doom and gloom' for Australian exporters. The CEO foresees a positive 2009 for Maritimo's American operation. Mochi Craft last week received the "Gran Premio per l'Innovazione" or Prize for Innovation, at the Genoa Show. The award, presented by "Vela e Motore" magazine, was given to the Ferretti Company for its new Long Range 23. The Long Range 23, launched at the Genoa show, was hailed by the magazine for its "Zero Emission Mode" hybrid propulsion system and the innovative FER.WEY (Ferretti Wave Efficient Yacht) trans-planning hull. The hybrid engine was earlier acknowledged by RINA with its "Green Star Clean Energy and Clean Propulsion" rating, Italy's most stringent green certification for pleasure craft. The award ceremony was held at the Villa Zerbino with more than 300 guests that included entrepreneurs, designers, technical experts and industry professionals. Luca Cordero di Montezemolo has commissioned the construction of the Morgan Yachts flagship, the Fast Commuter Morgan 93, which will be delivered in the summer of 2009. Luca Cordero di Montezemolo, protagonist of both the automotive and design worlds, has chosen a Fast Commuter which is unique. Morgan, in fact, is one of the few shipyards that still builds these classic megayachts which were used by New York tycoons to commute from Manhattan to Long Island during the period between the end of the 19th Century and WW II. The Morgan 93, designed by Tom Fexas who is among the most important naval architects in the world, is a real cult icon, where technology and style combine and intersect to create extraordinary details. The 93 is the flagship of the Morgan range, and a symbol of class and exclusive refinement. It has a unique appeal which envelopes the boat owner and his guests in an old-world dimension. The visual impact is one of harmony between a modern and performing fiberglass hull and a classic, solid wood-paneled superstructure. The result is contemporary comfort adapted to a welcoming and elegant 1950s ambiance which is both intimate and inviting. Every detail and option has been seen directly by the future boat owner in collaboration with the Morgan Style Center in order to create a tailor-made product where the keyword is excellence. Luca Cordero di Montezemolo, former president of Confindustria, is at present President of FIAT Spa, President of Ferrari Spa and the Libera Università Internazionale degli Studi Sociali (LUISS). Sea Ray Boats' Riverview facility in Knoxville, Tennessee, recently surpassed 4 million work hours without a lost-time incident. A lost-time incident is an injury that prevents the employee from returning to work the next day. According to a statement, the Riverview plant reached 4 million time-loss-free hours on September 12, 2008, after completing four years and 10 days of safe operation. Sealine International will not attend the 2009 London Boat Show in light of the 'current economic climate and its impact on the global leisure marine market'. Sealine traditionally has one of the largest stands at the London show. The news follows last week's announcement that Sealine is scaling back production in 2009 across its three sites at Kidderminster, Hartlebury and Burntwood, resulting in the loss of almost half its workforce. 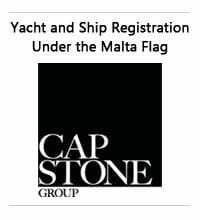 The company says it will attend one major boat show per country in each of its major European markets in 2009. Sealine will attend the Southampton show rather than London in the UK. 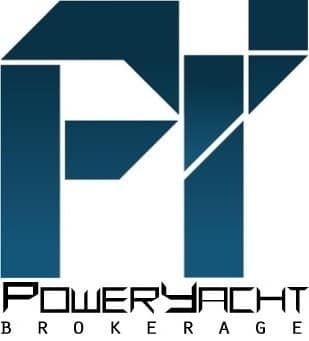 The boatbuilder will be present at Düsseldorf, Moscow, Cannes, Genoa and Barcelona. Sealine, a subsidiary of Brunswick Corp in the US, builds sports cruisers, flybridge cruisers and motoryachts from 8m-18m (25ft-60ft) in length. The company produces more than 300 yachts a year and employs 660 staff. Three Sunseeker craft to appear in Quantum of Solace. The much-anticipated new James Bond film QUANTUM OF SOLACE, due for UK release on 31 October, will feature two Sunseeker motoryachts in one of the biggest-ever 007 boat chases – as well as a further Sunseeker model. It’s the fourth consecutive time Sunseeker’s world-leading luxury motoryachts have appeared in a James Bond release. Daniel Craig reprises his role as Ian Fleming’s James Bond 007 in QUANTUM OF SOLACE, the Metro-Goldwyn-Mayer Pictures/Columbia Pictures release of EON Productions’ 22nd adventure in the longest-running film franchise in motion picture history. The film is produced by Michael G. Wilson and Barbara Broccoli and directed by Marc Forster. The screenplay was written by Paul Haggis and Neal Purvis & Robert Wade. Filmed on location in Panama in March 2008, the boat chase sequence – which took three months of preparation and comprised of more than 100 boats in support – features a lead role for the Sunseeker Superhawk 43 – from one of the company’s high-performance range. A part of Sunseeker’s proud history will also appear in QUANTUM OF SOLACE, when one of the company’s very first open-cockpit speedboats is used to transport James Bond. Originally built in 1970, the Sunseeker Sovereign 17 was fully restored in 2005 to celebrate the company’s early years and long history designing and building luxury motoryachts. The Sunseeker 37 Metre Yacht M4, one of the company’s latest and largest vessels, will also appear in the film. Sunseeker’s 37 Metre Yacht is the company’s most ambitious build in more than 45 years and the largest semi-custom production motoryacht ever to be built in the UK. Cameo Role also for Chairman Robert Braithwaite, the scene filmed on location in Italy in April 2008, features James Bond in an original Sunseeker Sovereign 17 one of the company’s very first open-cockpit speedboats. Robert Braithwaite’s appearance in the first boat he ever built is a shining example of how the company has grown over the past 35 years, as Sunseeker International is widely recognised as one of the finest marine brands in the world today. One of the most prolific builders in recent times Absolute, continues to surprise us with new innovative models. The next news from the Italian Piacenza builder is the 43, a much expected new model replacing the very sea worthy 45, recalled by many among the most seaworthy Absolutes ever built. The new 43 sits nicely in the range between the 47 introduced last year and the newly launched similar 40 model and continues the theme of the builder, offering full weather hard top boats with a sunshine attitude, that means a sun lounger aft with tender garage underneath. Interior layout is modern offering 2 well sized en-suite double cabins, with owners cabin forward and 2 single berths aft. The saloon offers a c-shaped settee with galley opposite. As all recent Absolute the new 43 is powered by IPS 500 or optional 600 versions. It is a fact now that Absolute, having 5 models powered by IPS is among the most knowledgeable when it comes to the innovative pod propulsion introduced by Volvo a few years ago. Now the question comes automatic, with the 47 among the fastest IPS boats in the market, it will be curious to see if the lighter and smaller 43 manages to beat the record of over 40 knots the bigger Absolute has achieved. Surely the challenge is there as Volvo IPS is designed for minus 40 knots top speeds, but the lighter displacement of the 43 makes me say we are for a new number. The new Ferretti 631 is an evolution of the 630, a model that was the pioneer of the on board space revolution thanks to the introduction of the astern galley. The main variations for this new model are exterior: the radar arch now an aileron similar to the one introduced on the 510 and 592 models, the spherical glass now enlarged but also featuring a sharper design, larger vertical portholes in the VIP cabin and last the extending of the flybridge area. As one can note here the theme of the 631 versus the 630 is of a more aggressive exterior profile while keeping with the elegance and comfort that have made the 630 such a unique and successful yacht in its category. The new Tiara 3900 Open artfully blends the pleasure of cruising and the passion of fishing, while staying true to the versatile Open design that is a Tiara Yachts legacy. Nowhere is this blend more successfully accomplished than the aft cockpit and its mezzanine seating. Innovative for a boat this size, the aft-facing mezzanine seat sight level is perfect for the cruiser and ideal for the fisherman eyeing bait. Below the new Tiara impresses thanks to its unique centre line panel hatch skylight, that runs the full length of the fore deck, flooding the accommodation deck with natural light. The layout is full of comfort, with the luxurious master stateroom to fore featuring a private head access, a U-shaped dinette that converts to a double berth with the back folding for a single pull man berth and to port we have the tucked galley located behind the entertainment center. Twin Cummins QSC of 550 and 600 hp power the 3900 Open giving speeds of 33 knots, and cruising of 30 knots with a range of 385 miles at an economical 26 knots cruising. A load of projects from Italian builder Solare, four of them introducing the new Navetta ship like yacht line. The first is the 22 mt Navetta, a new 72 feet ship explorer like motor yacht. Little information is so far available on this Solare flagship project, what we know is that the design is entrusted to architect Antonello Lucio Pontevolpe, who is responsible for all the new Navetta range by Solare. Another option apparently is that the same model is available in bigger 24 metre length model. From my part I would say that this is an interesting novelty as it seems a nice cross over between a motor yacht and an explorer yacht. Another interesting feature is the exterior design which seems taking a lot from the Italian trawler boat, especially to what regards the upper super structure looks. Another design entrusted to Antonello Lucio Pontevolpe as it is for all the new Solare Navetta line. The 68 is a semi displacement explorer yacht with a spacious three cabin three head interior. Submitted standard plans show also an interestingly innovative main deck with a bar upon entrance, spacious lounge saloon and a dining area forward. The galley is located on the lower deck, having next to it the the single crew cabin. Standing in the middle of the Navetta line will be the 60, also as the bigger 68 featuring a semi displacement hull. 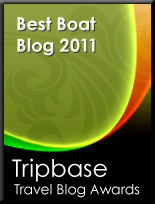 Accommodation layout is a 3 cabin 2 head interior, with a crew cabin aft. The main deck features a saloon with an Italian layout with a c-shaped settee saloon upon entrance, a a dining table for eight, opposite is the galley and forward we have the interior helm station. The flybridge is also a spacious affair being filled with settees and sun loungers for maximum Al fresco entertainment. The 58 Navetta Semidislocante features a similar layout to the 60, but all in a bit smaller sizes. The lower accommodation deck features the same 3 cabins, 2 head layout with an aft crew cabin and also the main deck and flybridge are similar to the 60. The main difference being the length which for the 60, having an extra two feet, which gains mostly in the aft main deck. Apart from introducing a new range of trawler influenced explorer yachts, Solare continues to upgrade its range of traditional cruisers and yachts with the introduction of the new 51 Lobster. Here we have the concept of Solare, which has always been an upper classic traditional super structure, and more modern hull lines with a deep vee fast hull below. The 51 Lobster will be available in two interior options, a standard 3 cabin 2 head layout and an optional 2 cabin 2 head layout, but in this later option offering a full beam owners cabin. The new Performance 1307 offers similar comfort and elegance as the bigger 1407 model, however in a somewhat slightly smaller size. Regarding sportsmanship, fun handling and fast off-shore behaviour, it stands its sister in nothing. On the opposite, thanks to the less total weight, even better performances are possible with the same engines. Inside accommodation is for 4 berths in 2 cabins, plus the additional extra 2 berths in the convertible saloon. 1307 is available with a variety of twin and triple engine options: five petrol Mercruiser and five diesel engines from Mercruiser, Volvo and Yanmar make the extensive engine choice list. A particular racing only version with triple 670 hp Mercruiser is definitely the faster of the lot. In addition the new 1307, as the picture above shows you is the first Performance model to be available with hardtop. Ginn sur Mer presents the 49Th edition of the Fort Lauderdale International Boat Show, the world's largest boat show, starting Thursday, 30Th October and going on till Monday, 3rd November. 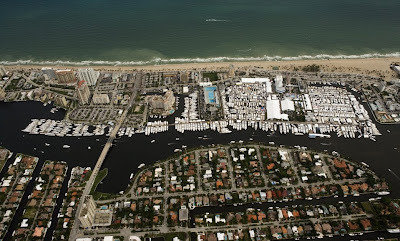 In its impressive setting of six locations, Fort Lauderdale features over 3 billion US$ of boats, yachts, superyachts, electronics, engines and thousand of accessories. This will be an important test to see how the greatest boat selling market, the USA is feeling the current economic downturn hitting the globe. So far all three important shows happening since September had a reduction in visits, but the rumours is also that sales have been down, especially in the entry level and medium sized boats under 15 metres. There is some important World previews, much expected re the following: new Bertram 540, Sea Ray 43 Sundancer a hard top sport cruiser, Tiara 3900 Open, Luhrs 37 Open and last but not least the new Super Sport Yacht from Lazzara the LSX 92. The new Jeanneau 50 Prestige is the next step for the French builder, in its line of high end cruisers and yachts. Italian designer Garroni continues his theme in this new model with a classic style and contemporary details, this new 50 Prestige perfectly illustrates current trends in this sector, and builds on the success this line of the French builder has enjoyed since its introduction a few years ago. The 50 Prestige follows in the previous models extremely comfortable interior layout, in this case among the most spacious in its size category featuring a rare 3 cabins, 3 private head and shower compartments. In all this you still have the much sought full beam owners cabin, all this in fifteen metres of length. A surprising interior volume, also on the main deck with distinct saloon, dining areas, but also the well-appointed flybridge does not disappoint. The 50 Prestige was a much expected model from Jeanneau and this range of well refined models, and continues to build on its success adding to it a very competitive attractive price. The first serialized hybrid propulsion power system that can be installed on all engines and drive combination. 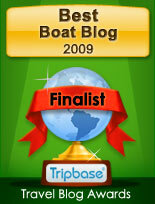 The environmental friendly hybrid solution marks a new chapter in the history of pleasure boat power. It not only assures zero emission and low speed manoeuvring in harbours, noiseless drive on inland waters and natural reserves, but also eliminated the need for a separate generator units for other on board equipment. The zero emission electric drive mode allows a speed of 5 knots using solely electric propulsion and switches to the combustion engine with an easy turn of the ignition key. The ingenious propulsion then gets boosted by the electric drive and enables quicker acceleration, lowering fuel consumption, improving response and dynamics. Significantly reduced maintenance costs and improved ease of service are further irrevocable arguments that Steyr motors is introducing a serious technological innovation. 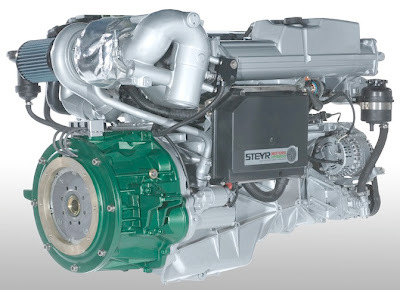 The Steyr Motors Hybrid has a power of 7 kw at 48 Volts, charging at 56 Volts and weighs 75 kg excluding battery pack, with a length of 100 mm. 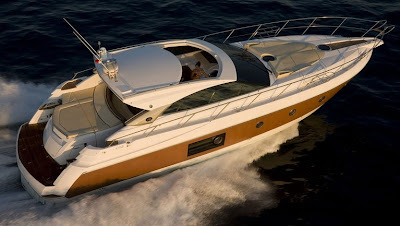 The Azimut 95 Flybridge, is born and built in Viareggio. In its almost 30 meters of length and over 175 m² of space devoted to life at sea the Azimut 95 sets new standards of Italian made elegance. Everything contributes to the immediate sensation of pleasure that one experiences stepping on board: the refinement of its immense spaces, the natural light that floods its interiors, the luxuriousness and elegance of its details. Dynamism and lightness are the dominant characteristics of the 95 external lines, made supple and sinuous by the hull windows and the three big scenic windows on either side of the deck house that give a perfectly diffused luminosity. Azimut’s latest creation has been designed according to criteria of rationality in the use of spaces, shapes that blend with the style, exceptional simplicity of operation, and maximum intimacy for owner and guests. The large flybridge, the largest in the category, the covered cockpit and the generous forward spaces are transformed into cozy "lofts" on the water. Attention to the concept of space is particularly expressed by the flybridge, a real "agora" on the sea, a multi–faceted place for meeting, socializing and having fun. The spacious main deck is rationally subdivided by fine cherry furniture between the large saloon and the dining area. A panoramic view of the sea is provided by the three central windows of the deckhouse, with the middle one descending to the level of the washboard. The wheelhouse area and the galley are also accessible from the outside, ensuring maximum independence between crew activities and the on board life of owner and guests. The lower deck presents four spacious cabins: the master stateroom is remarkable for its spaciousness and luxuriousness, featuring a double bath, Jacuzzi and shower, while an exceptional VIP stateroom offers a 45° bed and new large windows and the two guest cabins have twin beds. Once again the genius of Stefano Righini’s concept and the originality of Carlo Galeazzi have produced a new, innovative Azimut Yachts model: a privileged, exclusive place to live the sea en plain air. Championship leaders, Victory 1, took a giant step towards retaining the team’s World title after leading home a dream one-two finish in today’s Egyptian Grand Prix after seeing all three of their main title rivals falter, with Negotiator capping an impressive return to top-flight racing, finishing third. For Victory 1, today’s win, the team’s fourth of the season, moves them 15 points clear of team-mates Victory 7, and puts Al Marri within sight of his second world crown and Bin Hendi his first, but more importantly puts them 35 points clear of their Qatari rivals, with just two races remaining and with only 40 points on offer. With rough conditions anticipated, race officials decided to run a revised course and reduced the race distance to 70Nm, and the message from Victory Team’s general manager, Gianfranco Venturelli, before the race to both his crews was to bring the boats home in one piece. And, after seeing the pole-sitters Qatar 96 lead from the flag and then open up a comfortable lead, the Victory 1 crew looked to have settled for second place. The bonus came on lap 13 when the leaders hit trouble and slowed. Victory 1 swept into the lead, going on to take a comfortable win by over two minutes. For the Qatar team their day went from bad to very bad. With Qater 96 limping around the course to salvage valuable points, team-mates in Qatar 95, who were running comfortably in third place suddenly stopped a lap later, handing second place to Victory 7. Negotiator held off a race-long challenge from Foresti & Suardi to take third place, which marked an impressive return to racing for Chris Parsonage, who has sat out the last four races, and capped an impressive Class 1 debut for throttleman, Billy Moore. Foresti & Suardi 8 maintained it's impressive record for reliability producing their best result of the season getting an important fourth place. Disappointment for the Spirit of Spain 88 crew, retiring on lap12, while Class 1 newcomer Mohammed Abdelkader Ahmed, marked his debut with four points in eighth place in Roscioli Hotels Roma 60. There was also disappointment for SeveneleveN 18 who retired on lap five and Jotun’s 90 hopes of a hat-trick win ended on lap three. Class 1 now heads to Dubai for the final two races, with Victory 1 on target to win the World, Middle East and the Edox Pole Position Championships. Princess presents the second model of there new Motor Yacht line, which was introduced last year with the launch of the 95 foot flagship. With this new model Princess deliver an entry level super yacht with exquisite comfort, luxury and a sleek modern crisp shape giving a resemblance with her bigger sister. The 85 Motor Yacht is suited for long medium range cruising, thanks to a deep V hull and the draft-reducing propeller tunnels, ensuring easy handling. The layout is a flexible one ensuring maximum enjoyment on deck, with a spacious teak-laid flybridge incorporating a fully equipped bar and generous seating and sunbed options. These are complemented perfectly by a separate entertaining and sunbathing area on the foredeck coach roof. The cockpit provides another area for Al fresco entertaining and opens up through triple sliding doors to the saloon. A separate dining table seats eight within a dedicated dining area amidships, while the saloon is fitted with a contemporary U-shaped seating area and an entertainment centre, incorporating an LCD TV with up and down movement stowing itself in the starboard sideboard. Adjoining the wheelhouse, the galley is equipped to the highest standards with granite surfaces and generous refrigeration, as well as ample storage space and access to the port side deck. The crew have starboard deck access from the lower helm. Below decks, the accent remains on light and space with the master stateroom featuring vast vertical port lights, as well as a sumptuous pocket sprung bed. Owners can choose between a three or four cabin layout, all with en-suite facilities. Crew quarters are located aft of the machinery space allowing separation from the main guest owner accommodation. 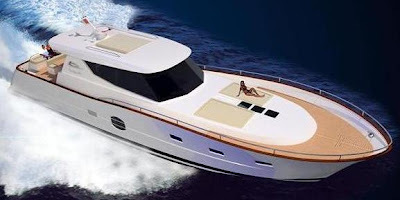 Italian builder Di Donna, presents the project of its new flagship, the 65 Serapo model. This is a step up for the Italian, Roman builder which with its current range its biggest offer is the successful 42 Serapo model, a traditional Gozzo cruiser with a planning hull, offered in Open and Cabin version. The flagship project of the 65 Serapo abandons the Gozzo design for Di Donna, offering a sports yacht with a traditional feel. Touches of tradition are felt in the deep wide side decks, the hard top coach roof, hull lines having the feel of a Gozzo and the wood being used on the main deck. So far Di Donna have not communicated any interior plans, although the large roundish central windows, tell us for a full beam owners cabin, with a traditional 3 cabin 3 heads layout below. New Broom 395 incorporates the latest developments and improvements taking place across the range, of the British builder. The exterior has been styled to include steps up both sides of the transom, the latest type of frame less windows, and a helm position console layout developed from the 425. The most significant change from the 39 model is the large aft deck. With steps up both sides of the transom the aft deck has been deleted and the cockpit area moved back as the 450. This gives a large sitting area in the cockpit. The specification and interior layout follows on from the 39, with the decor and joinery style being a further progression from the 425. The 395 is offered in the dinette and 2+2 form. The side door is not included in the specification, but may be considered as an extra providing there is sufficient lead time. The 395 is available with both single and twin engine installations. The new Estensi 420 Goldstar C, continues to upgrade the traditional lobster cruiser offer from this Italian builder. Based on the hull lines of the 400 Goldstar S, with important differences aimed at those looking for more tradition looks with the Goldstar C range. The C versus the S offers a squarish stern, spacious aft deck, more traditional superstructure pilot house design and the noticeable refined wooden patio door. Inside on the on the other hand we have the same well planned functional layout of the 400 S, with the main deck featuring an l-shaped settee to port in the main saloon, a cabinet opposite, and a helm station to starboard. Lower deck has the galley to port, master cabin with en suite head to fore, a double berth guest cabin to starboard, and second guest head. The new 430 Sports Coupe is an exciting project development for the new Mustang Marine team. This is an innovative Sport Cruiser from the new owners of the Australian Mustang Marine, who seems committed to the continual growth of this builder founded in 1974 and the addition of this new Sports Coupe range is the first of many new developments in the pipeline. Key Features for this project are the Volvo IPS propulsion power with joystick docking system, large swim platform with integrated BBQ station, extensive fully equipped entertainment deck, glass bi-fold entrance patio doors, moulded hard top with glazed sunroof, 2 or 3 cabin layout options and a more innovative fresh European design, let me add North looks outside. 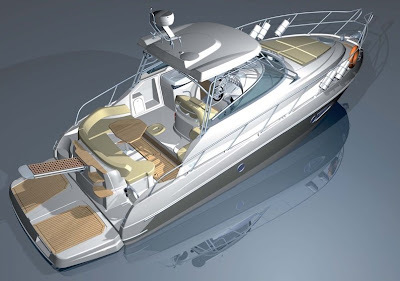 An important project for Mustang, for it's new flagship model the M 56 Sports Flybridge. A Sportfisher of 18 metres of full length with undeniable USA looks, offering comfortable accommodation and high sea keeping qualities, which is the norm for these style of yachts. One of the most distinctive, comfortable and sought out features of the M 56 is without a doubt the enclosed flybridge area, with internal stair case offering an all weather helm station, but also a great socializing area up top with the right comforts. Much appreciated on plan and hoping the real boat will be the same is the galley, located aft of the main saloon, perfect for entertainment with easy communication with the exterior cockpit deck, and the upper bridge thanks to the opposite facing staircase which leads up top. The main deck saloon has also 2 l-shaped settees to fore of the galley, one for dining and an other for socializing. The lower deck reserved all for sleeping accommodation has 3 cabins with 2 heads one of which en-suite. Standard power for the M 56 Sports Flybridge will be twin Caterpillars C12 at 715 hp each. Mustang is estimating a 20 t dry weight, light for a Sport Fisher but achieved thanks to the use of Kevlar in the construction process. Mochi 23 Long Range was without a doubt the highest star of the 48Th Genoa Boat Show, expected much since last year announcement that Ferretti Group was producing a hybrid yacht. The new flagship of the Mochi range, three decks plus flybridge explorer yacht had to be thanks to a host of two important firsts: the Zero Emissions Mode called ZEM Hybrid Propulsion and the Fer.Wey (Ferretti Wave Efficient Yacht Hull). Another important note for us yacht passionates was in seeing World famous Ferretti Group and designer Zuccon, both renowned mostly for high performance 30 knots plus yachts, challenge the explorer yacht market with a green concept, but also an innovative hull with a top speed of 16 knots, cruising at 13 knots and range of 1500 nautical miles at 9 knots. The result shows the 23 Long Range already in the future, to what regards Eco friendliness, being the first to obtain RINA Green Star Clean Energy and Clean Propulsion certification, and also efficient hull dynamics thanks to the Fer.Way hull, which improves the trans planning speeds of 12 knots plus, where displacement and planning shapes start behaving in an abnormal way. Standard interior arrangement of the 75 foot, 23 Long range is a 3 cabins and double crew berth aft layout. Alternatively an optional four cabin version with fourth bunk cabin is available, plus also the option of an extra captains cabin up top on the third deck, next to the wheel house. Praise has to be given for Ferretti Group, Zuccon International Project and the Mochi brand, who with the 23 Long Range have opened new horizon in yachting technology and design, inventing an Eco friendly motor yacht and reinventing the concept of displacement and semi displacement hull types. With three races remaining, the teams find themselves facing the business-end in the race for the world title, as they head to the highly-fashionable resort of Porto Marina on Egypt’s Northern Mediterranean coast, for the Egyptian Grand Prix, round 6 of the Class 1 World Powerboat Championship, round two of the Middle East Championship. The newly-crowned European Champions, Inge Brigt Aarbakke and Jorn Tandberg, currently lying in fourth place, will line up in Jotun for the Egyptian Grand Prix on Saturday, 25 October, looking to maintain their charge and move up in the championship standings and to reduce their 19-point deficit in the World title race by taking their third consecutive win of the season. Following the drama that unfolded in the last race in Romania, just 21 points now separate the top five boats. Championship leader Victory 1, have seen their points lead cut in half over the last two races, and will have to put the disappointment of losing out on the European title by one point behind them and try to restore there winning ways. The immediate challenge to their title lead comes from team-mates Victory 7, currently lying in second spot and 10 points adrift, who have been a constant threat all season and will be hunting down a fifth podium finish, if not their first win of the year. Qatar 95’s impressive second place last time out, running the Sterling V8 power-plants for the first time, catapulted it into third place and crucially, ahead of their team-mates, Qatar 96 who are down in fifth place, to head the Qatar challenge for title honours. And with a raft of modifications carried out on Qatar 95, they will be looking to go one better and win in Porto Marina. Foresti and Suardi 8 Italian-Norwegian pairing, are proving to be one of the season’s most reliable outfits - taking five fifth place finishes and one sixth - and lead the race for middle-order supremacy, with Montavoci, a rough water specialist, hoping to spring a few surprises if they get a repeat of last year’s rough conditions. Spaniards Spirit of Spain 88, will be aiming to step up their levels of performance, running their Mercury-Class 1 V8-powered Tencara, for the first time with Class 1 newcomer Mohammed Abdelkader Ahmed making his competitive debut in the team’s second boat, Roscioli Hotels Roma, alongside Giovanni Carpitella who makes a welcome return to Class 1 action. Following a frustrating few races, but a solid sixth place in Romania, SeveneleveN 18 switch back to the Giorgi V12 engine-package and is another team who will benefit in rough seas and will be confident that they can grab another top-six finish. After crashing out of the opening race of the season in Qatar, Chris Personage returns to front-line action in Negotiator 50 for only his second start of the season. But with regular driver, 2005 World Champion Bard Eker, unavailable, Parsonage has drafted in the services of the experienced American throttleman Billy Moore to take the sticks, with team boss Parsonage switching to takeover driving duties, his first time behind the wheel for two years. The return of Negotiator means that four out of the ten boats lining up in Porto Marina will be running V8 power-plants; Negotiator and Qatar 95 with Sterlings and Spirit of Spain and Jotun with the Mercury-Class 1. And whilst Negotiator 50 world title aspirations ended in Doha, the likelihood is, that they will be in the mix in the fight for the Middle East Championship, and could well play a role in the outcome of the World Championship if they can take points away from any of the title contenders. What no one can predict will be the weather and conditions that teams will face in Porto Marina. But a repeat of last years extremely rough conditions will act as great leveller in terms of boat and pilot performance, with the 20-lap, 91.67Nm Egyptian Grand Prix shaping up to be a crucial race in the outcome of the 2008 world title. Sessa C 52, the famous Italian builder flagship, is now being presented in a new and revised version. The first notable difference is the hard top, now revised with a more aggressive profile, similar to what we have seen on the successful C 46 introduced last year and the new C 43, the 2008 novelty for Sessa Marine Yacht Line. Other important differences are the more powerful engines now offering Volvo's D12-800 series 774hp as the top option, better designed outdoor cockpit with new and sporty windows for a better clearer visibility and two new broadside colourings Copper and Turquoise, adding on the previous Navy Blue and Ruby Red. Inside Sessa also improved its option now offering two indoor versions: “Tradition” and “Innovation”, both with a strongly innovative and unique personality. Worth to note that Sessa in recent times has shown impressive new models, and this new version of the C 52 keeps on improving the already successful flagship model. 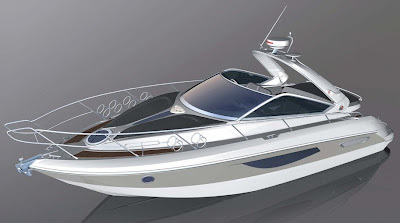 A new generation project for USA builder Sabre and there line of motor yachts calling traditional looks is soon to be launched, with this new 40 Sedan. This project from Sabre is not just a new model outside but represents important manufacturing advances, being fully built with resin infusion, both hull and deck. This latest process in fiberglass lamination builds a lighter and stronger boat resulting also more fuel efficient. Another novelty will be the propulsion, as it is fitted with the modern and latest Zeus pod drives system, giving better fuel efficiency, saving as much as 20% on fuel costs, but also quieter and making boat handling in tight quarters a breeze. The 40 Sedan will be powered with twin Cummins QSD 5.8l at 380 hp each, coupled to CMD Zeus 3500 Pod Drives. Inside it offers a spacious environment with a lower deck offering four berths in a twin stateroom layout and a spacious single head. An optional flybridge version, with second helm station up top will also be available. The new 840 Altura launched officially during the Cannes show last month, is an evolution of this legendary new line, giving a sea experience with the comforts of a villa, enjoying the design, quality and technology of Ferretti yachts. 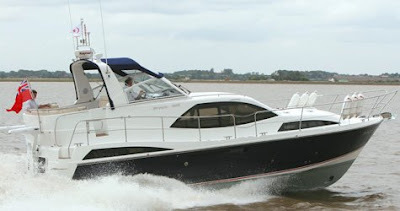 The Altura 840 marks the evolution of the 690 Altura launched in 2005 but also is a renewal to the yards historical heritage of the mid seventies Altura 42, the motor sailor, but also the successful flybridge cruisers that where the Altura 46 and 49, pioneer models which opened a new age of motor yachting with there innovation. Designed by Zuccon Project in collaboration with Ferretti's AYT, Altura 840 now stands alongside Altura 690, providing a comfortable yacht with diverse spaces and advanced technology, complemented by furnishings of a nautical feel, with extensive use of wood. Stepping on board the main deck reveals spaces outside for social interaction thanks to a large rectangular table, settee aft which accommodates up to eight guests. Further forward we have more spaces that encourage open air living, complimenting the aft cockpit with another lounge area forward with two large sunpads, a living area with a double settee divan and retractable parasol providing shelter from the sun. The flybridge equipped with a hard top provides shade for the living area up top, which has a large U-shaped divan, a reclining sunpad further forward, expendable table, wet bar grill unit, a large sunpad aft, helm station located to port and tender with crane davit aft. The aft bathing platform features additional tender stowage, with convenient launching thanks to an electric hydraulic system, also providing a beach platform with easy water access. The interiors of the new Altura are finished in teak with light coloured fabrics for the upper sections. Light is a recurring theme in all this model thanks to big windows in all the right places. The welcoming saloon on the main deck has a c-shaped divan, opposite we have two movable armchairs and further forward a working expendable office desk. Two steps down we go into the innovative part of the Altura 840 which is the covered saloon dining area, featuring a c-shaped dining table and a galley with sliding door opposite. The raised helm area is two steps up from the main saloon featuring the console to port, and an l-shaped settee dinette with room for up to eight people to starboard. The guests accommodation lies forward, comprising a twin cabin, a twin cabin with L-shaped berth and the double VIP to fore. Every cabin has a private bathroom with separate shower. The 840 Altura follows the 690 also with the aft full beam owners cabin, separated from the other accommodation and accessible from the salon, giving an extremely spacious and natural lighted area, thanks again to large side and aft windows. Crew area is located mid ship with 4 berths, and a separate communication with the galley and deck allowing maximum owner and guest privacy. In terms of comfort and speed, the Altura 840 offers characteristics that reflects the technology of the entire Ferretti fleet, starting with the Mitsubishi ARG (Anti Rolling Gyro) stabilisers reducing roll by fifty per cent, standard for the new Ferretti 840 Altura. It is also provided with latest generation Naviop instrumentation, a cutting edge control system providing simple, immediate touch-screen monitoring and management. The engine room is located amidships between the owner cabin and crew quarters, for total comfort and greater privacy. 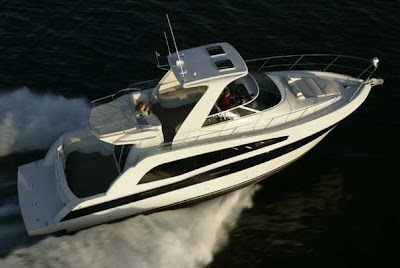 Power for the Altura 840 is provided by two MTU 1823hp give cruising speeds of 27 knots and a max of 30.5 knots. Grand Banks introduces the latest addition to there growing Aleutian Series of raised pilothouse yachts, the 72 Aleutian SC. Scheduled for launch in 2009, this new model joins the 72 RP as the largest and most luxurious yachts in the Grand Banks fleet. One look at the 72 SC plans and renderings, reveals the key difference between the two 72 Aleutian models: where the 72RP boasts an open lower cockpit with stairs up to the main deck level, the 72SC instead features a one level flash main deck that extends aft from the salon to the transom creating a wonderfully large outdoor living area covered by the flybridge deck above. In addition, the 72SC will also be the first Grand Banks to offer the option of a four-stateroom layout. A nice looking hard top sports cruiser, from renowned USA builder Cruisers, this is the new 420 Sports Coupe launched to much acclaim in the Spring of this year. The new 420 Sports Coupe according to its builder, is the first boat of its kind with a walk through windshield, and a sunroof hard top. There is other bonuses on this Sports Cruiser which make its attention noticed, like the spacious cockpit l-shaped wetbar, double helmsman seat and full beam extended platform suitable for tender stowage. It's lower accommodation deck features a 2 cabin 2 head layout, with a spacious master island berth to fore and a mid stateroom that can convert to a double berth thanks to infill cushions. Propulsion wise the 420 Sports Coupe can be offered with traditional inboard shafts or the latest Volvo pod drives. As it is expected from a USA builder both petrol and diesel options are available. Four new projects from World renowned Italian builder Cranchi, scheduled for debut in 2009 with two being of completely new concept, and the remaining based on existing models. The 43 Atlantique project is semi new, having hull and propulsion taken from the 43 Mediterranee model. Designed as all recent Cranchi models by Aldo Cranchi, this 13 metre flybridge cruiser project fills the gap between the long standing 40 and 50 Atlantique models. Accommodation is a 4 berths 2 cabins, 2 heads layout, with galley down. The main saloon has an l-shaped settee, which if desired can transform to an extra double berth. Furnishings and fittings are in a modern minimal style detail. 43 Atlantique uses Volvo modern and much marketed IPS pod propulsion, a rare choice so far from most of the main stream builders, as what regards flybridge boats. The option is for IPS 500 or 600, with the later giving estimated top speeds of 35 knots. Consumption, the main IPS advantage is a low of 106 litres per hour at 30 knots cruising. New version for the Zaffiro 36, presented a year ago by Cranchi, adding the much requested hard top over the helm area. The hard top although similar to the 36 Pelican is different, having the new 36 Zaffiro HT a more sporty design profile. Still with so much competition lately, mostly offering integrated designs, our thought is that Cranchi could have done something better then putting a GRP mould supported with a metal frame for the new 36 Zaffiro HT version. A new Endurance is always good news from Cranchi, being this range of Sportier Cruisers, with big exterior areas having a huge following. The 33 Endurance project looks a nice aggressive looking boat, with big central windows allowing for maximum light inside. The deck of the boat is well planned with a big sun lounger aft, l-shaped settee dinette, double helm station to starboard and another passenger seat to port. Inside we have a transformable vee berth to fore, surprisingly spacious head with separate shower stall to port, galley to starboard and double mid ship cabin. Performance is a 37 knots max with the smaller diesel option of twin D4 300 hp each. A more powerful twin D6 of 330 hp each will be available as optional for higher thrill seekers. 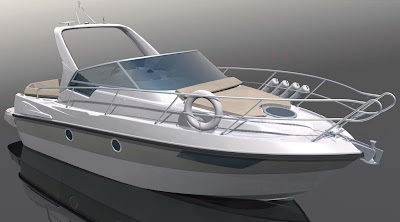 Entry level Sport Cruiser project for Cranchi Master Cruiser line, is this new 29 Zaffiro. This new 29 Zaffiro surprises thanks to the new modern big side windows located to fore, a rare design for this size giving loads of natural light inside. A spacious boat inside and outside, the 29 Zaffiro redesigns and recaptures space. It's outside cockpit looks spacious with a big c-shaped settee reminiscent of bigger boats, a wet bar and a sun lounger next to the helm area. Below we have a classic layout with a v-shaped settee forward transformable to a double berth, a galley to port, head shower to starboard and a double berth below to mid ship. 29 Zaffiro will have 5 engine options, 3 petrol and 2 diesels. The Diesel options are a single D4 at 300 hp and a twin D3 of 190 hp. The twin diesel option gives 32 knots top speed and a range of 165 nautical miles at 24 knots cruising. The 42 has already proven herself to be the most successful Trader model in history, and this third variant increase the popularity by adding a sociable flybridge, commanding helm station and magnificent covered aft deck to the boat. One of the new Trader Generation II designs, the 42 has been designed to combine the very best of the traditional cruising motor yacht with the latest design and technological developments. Designed with Tony Castro naval architects, the 42 exhibits the new Trader styling language first seen on the magnificent 64 Sunliner. The new look is crisp, modern and elegant while retaining the distinctive Trader character. Utilizing modern production techniques at a new purpose-built factory, Trader are able to develop the 42 with a wide range of personalisation options allowing each owner to specify their craft to suit their particular needs. This new flybridge version is the latest presentation of the three available exterior body styles, which also include a choice of two or three cabins and alternatives for tender stowage. Always a strong point for Pershing yachts is the accommodation, offering motor yacht comfort with aggressive exterior lines. The new 64 does not disappoint this philosophy and improves the heritage left in the replacing of the 62 model, which had a clever layout with its stand out feature being the mid ship VIP cabin with a separate deck entrance. The 64 abandoned this appreciated idea but created new ones for the spacious galley, with separate entrance from port side of the main deck and the layout below now all reserved for the three spacious cabins. Full beam owners cabin located mid ship, VIP cabin to fore and in between a twin guest cabin. A crew cabin with full facilities and separate entrance from the main deck is located mid ship. The main deck is where the innovation of the 64 stands, and is outstanding thanks to the patio door which if desired can literally disappear below making this area a full one space. Pershing was keen to give there technical magicians, who worked this concept for the 72, more work and presented it also for the 64. This gives a whole meaning to the Pershing main deck! Featuring a host of areas starting with the sun pad with settee aft and an l-shaped dinette all on the outside area. Further forward under the hard top we have a spacious c-shaped saloon settee to starboard with a cabinet opposite, a small l-shaped settee to port and helm station to starboard. Another important element for Pershing is the performance, which from the nineties onwards has always been part of the revolution of this shipyard offering 40 knots plus speeds as standard. The hull shape is a modified vee with a 17 degrees deadrise aft, coupled with another standard feature of the yard the surface drives, which are part of all the range expect for the smaller 46 model. The new 64 amazes you thanks to its 46 knots performance, but also its 40 knots cruising which give a range of 285 miles with the bigger engine option of twin 1550 hp V12 MAN. A smaller powered twin MAN 1360 hp is available, giving 41 knots top speeds, cruising at 37 and a range of 308 nautical miles. 20 metre open hard top yachts are on the increase in the last years, with all renowned builders having a proposition for this type of boat. The 64 is a fast and comfortable boat, reuniting two worlds often separated in one. If performance of 40 knots is in your musts, then along with the Pershing your viewing will have only two other models, the semi custom AB Yachts 68 in production for 10 years now and the also new Wally Power 64. If speed is not in your priority lists then you can have a look at the others, with some of them close to a whisker of 40 knots. Competition criteria is based for hard top with patio door, of 19 and 20 metres in length. Princess have also the newly launched V 62, but decided to give preference to the V 65 being closer to the 64 on specification, only 20 cm longer, and 38 knots speed with big engine option. 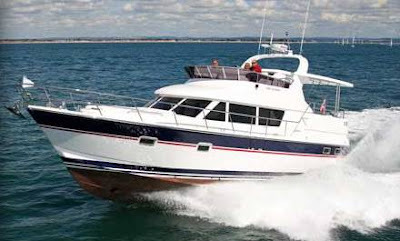 WILD CARD: Mochi 64 Dolphin Sun Bridge - hardtop lobster, 32 knots max, nice! Another trend setter, from Pershing, which with the 64 refines the basics of sport yachts design and creates a spacious and fast sport yacht. The 64 is another classic in the range from the Italian builder who has always specialized in fast modern looking open hard top boats, with great comfort and much thought being put in each. So it's not surprising to see Pershing set the trends again as was the case with the 45 model, there first success launched in the mid eighties, up to this latest release which has something better going on versus what the rest are offering. It is speed, it is comfort but surely above all it is a Pershing and a Fulvio De Simon new idea. Picture Copyright Pershing. Data Pershing. Fiart introduces a much waited new model, the 4 Seven Genius. Presented last week during the Genoa show, where a year ago it was announced as a project, this was a much anticipated model from the Naples builder, renowned for the sea keeping, quality construction, and practicality of its boats aimed for those who enjoy there boats in the Mediterranean. The new 4 Seven continues to upgrade the prime Genius line, introduced in the early nineteen nineties, and today starts from a 28 model up to the flagship, 50 Top Style. With its carbon finished hard top, as seen on the 50 Top Style, and flash deck the new Four Seven immediately characterizes itself as a Fiart. The aft deck cockpit is spacious and airy this being another trademark of the Italian builder. Below accommodation is for a traditional family layout with three spacious cabins, offering 7 berths. Engines are twin IPS 600 of 435 hp each, so far speeds have not been announced, but with not a so heavy displacement of 13 t, imagine a top speed in middle thirty knots range. The new 4 Seven Genius is also the latest in construction technology, thanks to vacuum infusion used for the hull and deck, and a carbon fibre hard top.